After having 8 restaurants make Yelp's coveted list last year (with 9 in 2015 and 8 in 2014), only 2 San Diego eateries made it to the crowd-sourced reviews aggregator's Top 100 Places to Eat in 2017. Since its inception in 2014, there have been at least eight San Diego eateries to make Yelp's annual list each year. This year, only Sunny Side Kitchen in Escondido and Classics Malt Shop in San Diego's Midway District made the list of top dining destinations across the United States. "In our fourth annual list we are honoring eateries from across the US, nearly all of which have a perfect 5-star rating," said Shannon Eis, Yelp's VP of Corporate Communiation. "You may notice that most of these businesses are pretty unassuming, offering guests a no-frills type of dining experience, and yet Yelpers go nuts for them. On our past top 100 lists, you would be likely to find some of those 'famous' restaurants with thousands of reviews, over many years, holding steady at 4.5 stars. 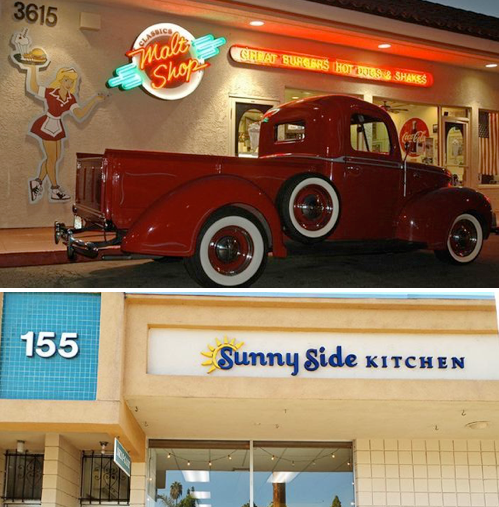 This year, those places were crowded out by other businesses that performed spectacularly in the last year"
Sunny Side Kitchen, which took the #51 spot on the 2017 list, is located at 155 S. Orange Street in downtown Escondido and serves a menu of sandwiches, paninis, salads, soups, coffee and more. Classics Malt Shop, which rounded out the list at #100, is a 50s-themed diner located at 3615 Midway Drive in the Point Loma area. San Diego restaurant's listed on Yelp's Top 100 of 2016 included Tacos El Gordo De Tijuana BC in Chula Vista (#17), T-Deli in Hillcrest (#30), Oscar's Mexican Seafood in Pacific Beach (#31), Sushi Ota in Pacific Beach (#42), Coop's West Texas Barbeque in Lemon Grove (#47), Beach Break Cafe in Oceanside (#50), Phil's BBQ in Point Loma (#68), and Yoshino Japanese Deli in Carlsbad (#71). In 2015, San Diego locations listed on Yelp's Top 100 included Bobboi Natural Gelato in La Jolla (#8), Yoshino Japanese Deli in Carlsbad (#21), Tacos El Gordo De Tijuana BC in Chula Vista (#29), Vitality Tap in Downtown San Diego (#49), Eddie V’s Prime Seafood at The Headquarters in Downtown San Diego (#57), T-Deli in Hillcrest (#68), Embargo Grill in Sports Arena area (#70), Beyer Deli in Bonita (#79), and Mister Falafel in Clairemont (#89). The methodology behind the 2017 list weighed more heavily on recent reviews of restaurants to give more up-and-coming eateries a chance. This year, half of the list is made up of businesses that opened within the past two years. For more information and to see the full list, visit yelpblog.com/2017/01/yelps-top-100-places-eat-2017.